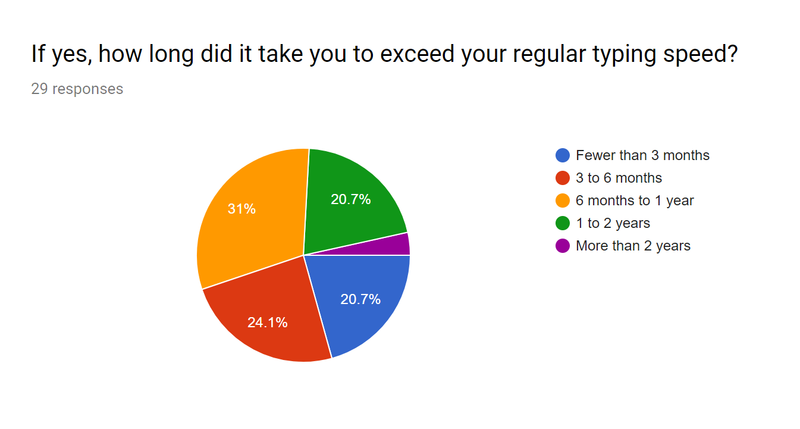 Responses to the 2017 OSP Community Survey! 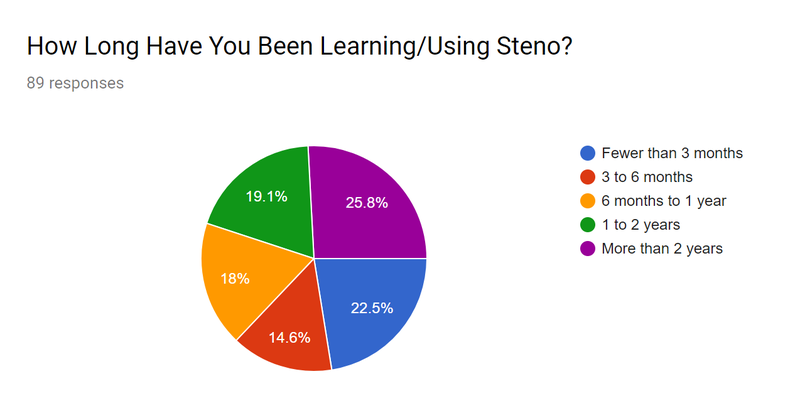 It took me a while to get to these, but I finally made a digest of selected responses from the 2017 Open Steno Project Community Survey. Here are the complete responses, if you're interested in all the details. I figured I'd just touch on a few highlights. First off, we got a total of 91 responses, quite a bit higher than last year's 72! We can also see signs of the Plover community maturing, with almost 40% of respondents in the 60 to 260 WPM range, compared to last year's 30%. 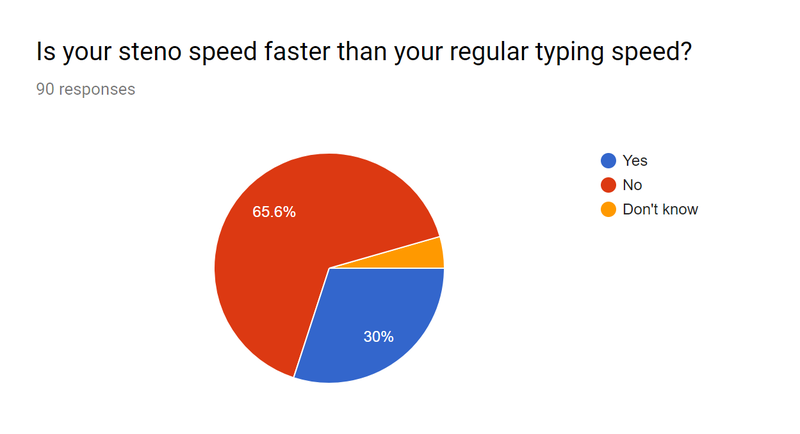 Most respondents are still working on exceeding their regular typing speed, which isn't too surprising, considering that many of our new recruits this year came from ultrafast speed typing circles. But of those who have exceeded their regular typing speed, 75% did it in under a year. Most of our users are not interested in formal stenography programs. 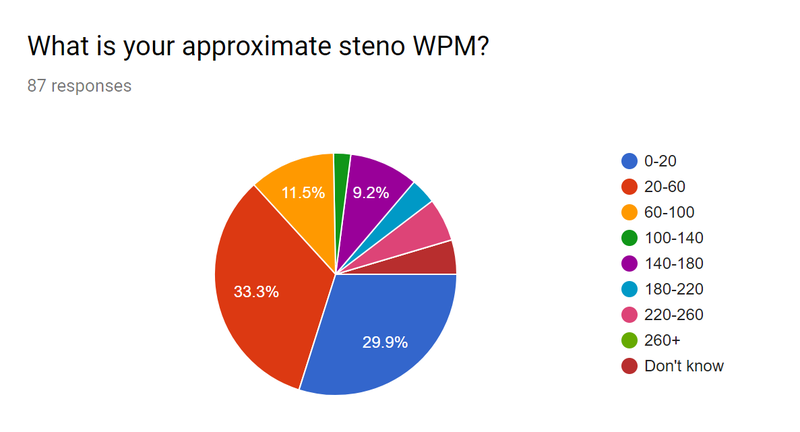 Which isn't too surprising, since most of them want to use steno to write prose or code. We've got a strong cross-platform community, with 55 out of 88 respondents using Plover on operating systems other than Windows. No other steno software runs natively on non-Windows operating systems, so we've pretty much got that end of the market sewn up, haha! "Documentation is getting better all the time! Good work! Discord has been the best thing to happen to Plover lately." "I'm not fast yet but am usually able to guess new words, and steno intrudes into my mind sometimes and there I am mentally stenoing stuff. Weird but fun." "Finding it too hard as a self teach option." "Plover allows me to use my writer with my Mac without having to use Windows! What's not to love?!?" "Would love to see absolute beginner training exercises in Steno Arcade." "Learn Plover is very good, but I'd like to see the theory spelled out more explicitly; there's a lot that's not covered, and you have to learn inductively, more or less." "Plover got my career off the ground. Thanks." I definitely agree that we need more entry-level training and drilling tools. Ted's new textbook should help, as will Stenomancer. But clearly learning steno theory and building speed is possible with the currently available tools, which thrills me to bits. Let's keep it up! I hope next year's survey response count will be even bigger! I got a Gherkin! Isn't it adorable? The delightful Kyzak on the Plover Discord built it for me, and I love it. Sadly, the key mapping was messed up, so I'll have to send it back before I can use it, but the size and shape are extremely endearing, and the touch seems quite nice as well. If you want one but don't have the skills to build and solder it yourself, you might still be able to nab one if you head over to the Discord. Especially great if you have small hands and value portability.